Australia is a world-leader in electrical safety, yet, as comprehensive as our Electrical Wiring Standards are, the simple fact is mistakes, accidents and good old wear-and-tear can always ruin the party. Here are five common electrical faults: their causes, their risks, and what you can do about them. Every electrical system was originally designed for a particular purpose. The wiring designed to supply a residential home can’t support the electrical load required to power a factory, for instance. Excess wiring load is the situation when the wiring and circuit breakers don’t have the capacity to handle the electrical draw of the equipment plugged into their circuit. The first symptom of this problem is usually circuit breakers that constantly trip on detecting abnormalities in the current. If your electrical system is forced to carry more load than it can handle for too long, then you’re going to have electrical components that wear out well before their normal lifespan. No system is idiot-proof. Simple user error can trigger faults in even the best electrical wiring systems. Overloaded circuits are perhaps the most common kind of user error. The typical case of an overloaded circuit is too many outlet extenders. Double adapters, power boards, extension cords and voltage converters all plugged together in a mass of mixed-up power. Even when it is spaced out – such as power board to extension cord to power board – it’s too much. The resulting electricity draw can easily exceed the circuit’s rated amperage. Major problems can ensue. While devices like fuses and circuit breakers can catch overloaded circuits before they turn into a house fire, it’s best to prevent the issue altogether. Always use outlet extenders as instructed and be mindful of how many appliances are plugged into each powerpoint. Heavy-duty appliances/equipment that draw significant amps should have their own circuits just to be on the safe side. Brisbane is no stranger to thunderstorms. With them comes the potential for power surges. A power surge is the result of a sudden increase in voltage in the electricity grid. The typical culprit is a lightning strike, yet power surges can also be caused by power grid switches, damaged electricity poles, or even large home appliances powering up and down. A big enough surge can fry electrical appliances or even cause fires, so it’s essential to protect your home against them. A surge protector fitted in your home switchboard by a licenced electrician is an essential safety precaution. Plastic-sheathed cables are notoriously easy to damage if they’re poorly placed or left exposed to the elements – even when installed in areas that only get infrequent traffic. Accessible ceiling spaces are a particularly common hotbed for this issue. One knock from one tradie shuffling around in your ceiling is enough to accidentally damage unprotected cabling. Simply treading on these cables can damage their insulation and potentially expose live wires. The electrocutions and house fires that can result are all too common. To prevent the problem before it occurs, all cables should be installed following the Wiring Rules. These are standards that help electricians design, construct and verify electrical installations – they also contain specifics regarding cable protection. If you suspect your house hosts unprotected electrical cables, it’s time to call in a professional. They’ll be able to check for existing damage and ensure your wiring is up to code. A junction box is a plastic or metal enclosure that protects a connection – the junction – of two or more electrical wires. Used properly, they prevent electrical fires and ensure connections are reliable. Problems arise when junction boxes get overfilled as more and more wires, circuits and components are added over time. Cramming too many wires into a junction box risks the wires overheating or short circuiting. Further, wires that are crowded too close to the box frame are also more likely to be accidentally nailed or pinched during the box’s installation. All are classic causes of building fires. Junction boxes should always be used in accordance with the Wiring Rules. Plastic junction boxes are typically stamped with their approved volume. For a steel box, you may have to calculate the volume manually. You can see why we said electrical faults are serious business. Left unchecked, even the smallest wiring mistake can cause catastrophic damage. It really can be life or death. However, our society wouldn’t rely so much on electricity if it wasn’t so safe when managed properly. 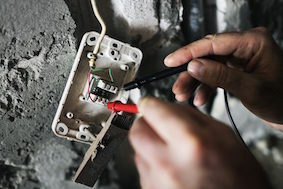 So, the best thing you can do to protect your home is identify electrical issues early. Employ a qualified professional to inspect your wiring, implement any fixes and give your system the regular maintenance checks it needs to keep you and your loved ones safe.